The fans chanted, “Palestine, Palestine!” as they stomped on the Israeli flag. Perhaps Israel national team soccer player Ben Sahar was on to something. His comment raised eyebrows, yet it appears that his concerns were well-founded. 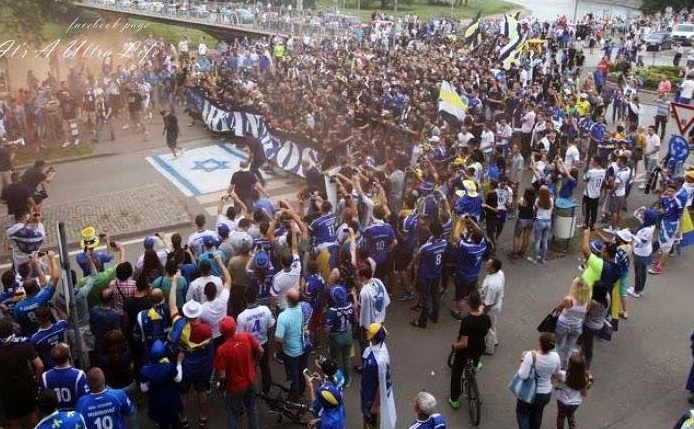 Pictures emerged of mobs of Bosnian fans stepping on a replica Israeli flag before the match. There were also reports that some extremist fans were chanting anti-Israel and anti-Jewish slogans. Two goals by striker Edin Visca and a penalty from Edin Dzeko helped Bosnia to a 3-1 win, reviving the hosts’ chances of reaching the finals in France. Visca scored in the 42nd minute after Israel took a surprising lead against the run of play a minute earlier through striker Tal Ben Haim. Manchester City’s Dzeko put the hosts in the lead in added time in the first half and Visca put the match to bed with a header from close range in the 75th.